Last week, I started laying the groundwork with respect to evolution, natural selection and random mutation. As before, for the purposes of this post, “evolution” will be used to refer to “macro-evolution” or the evolving of one species into another species. And for today, I want to focus a bit on evolution itself outside of the mechanisms of natural selection and random mutation. When we look at what are considered transitional forms by evolutionists, what we typically find are creatures separated by “millions of years” which have some similar traits. As far as providing substantial proof of transitional forms, however, I don’t see this being very conclusive. After all, there are many different species of creatures who have similar traits and yet are members of quite distinct and separate species. It reminds me, somewhat, of how a good computer programmer works. Once a computer programmer writes code that can do a specific task, he no longer needs to rewrite new code whenever he wants to perform that task. He can simply re-use the existing code that already does it. This is how we ended up developing what is known as “object-oriented programming.” You create a “code object” and then you use that object any time it is needed to perform a task or set of tasks. The same holds true for creation. Once a creature was designed to breathe oxygen, the design structure for processing oxygen can be used in different species to accomplish the task of breathing and processing oxygen. The same would be true for movement, whether on two or four limbs. The fundamental parts of the skeletal structure can be very similar since they are designed to perform a specific set of tasks. The so-called transitional forms, being so far apart in time according to evolutionists, would be like looking at a map of the United States and seeing fragments of roads mapped out around the country. Using the logic of evolutionists, one would look at this map and determine that if a road was at roughly the same latitude and pointing in the same general direction as another road 1,000 miles away, one can conclude that these must be parts of the same road. Obviously, this is not necessarily the case. In fact, it rarely is. But that’s how evolutionists tend to map out their transitional forms. If a species exhibits some similar traits with another species from millions of years before (or after), they conclude that the one species is descended from the other. That is a huge leap of logic that is not supported by the evidence. Another aspect that evolution fails to explain is what is known as the “Cambrian Explosion.” This term refers to the sudden appearance in the fossil record of a very large number of completely formed, complex organisms. There is no evidence of any sort of “lead in” to all of these organisms. They simply appear in the fossil record quite suddenly. Almost as if they were…suddenly created! Amazing, isn’t it? So, not only do we not truly have transitional forms, we also have evidence of a sudden appearance of fully-formed, complex organisms with not so much as a hint of them having evolved from any type of predecessor. And, as if that were not enough, there is one more issue about evolution that raises a pretty significant red flag. 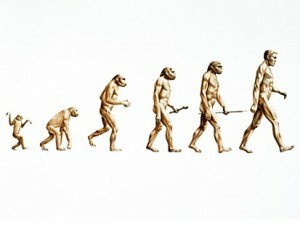 At the risk of over-simplifying the thought, if we are descended from apes, then why do we still have apes? Now, understand that it’s not quite that simple. But, the overriding logic can work in many areas. For instance, why would humans be the only animals to evolve with the ability to reason as we do? Outside of that, there is a whole bunch of concern about DNA and such, but I’ll touch on that a bit more when I get more into natural selection and genetic mutation. For now, we’ll close this out by stating that, while some of the information and concerns stated here do not necessarily disprove evolution, it is simply to point out that there are a lot of unanswered questions as well as some difficulties which, to me anyway, seem to make the idea of evolution less plausible as an explanation for how we got here.